Bottle #1 of 100 from “Vintage 1964” barrel, first in new Winchester Collection of single malt whiskies aged for a half century, goes on sale on October 1 exclusively at Harrods. 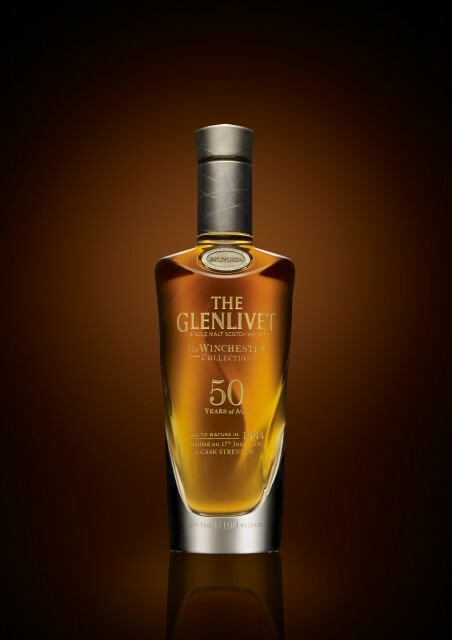 Chivas Brothers’ The Glenlivet brand has formally launched its new Winchester Collection of 50YO single malts, announcing that the 100 bottles produced from its “Vintage 1964” barrel will be priced at £17,995 per bottle and will go on sale at Harrods where it will be available exclusively for two weeks before being made available worldwide. In an early August media preview at The Glenlivet’s Speyside distillery, master distiller Alan Winchester, for whom the collection is named, explained that the whisky was laid down a half-century ago in a Bourbon-aged oak barrel by then master distiller Bill Smith-Grant, the last descendant of The Glenlivet founder George Smith. “When Bill Smith-Grant laid down the original casks in 1964, the world was a very different place and yet, while everything was going on around them, the casks just sat there with time helping to create the amazing end result which the world will soon have the opportunity to savour,” Winchester said. “There will always be people who want a 20 or 30 year old vintage. Our challenge was to hold off and realise that the wait really would be worth it. And it is,” said Winchester. Indeed, the whisky tasted quite lively for its years, with the requisite Bourbon-aged characteristics of cracked grain, pear, pineapple, honey and toffee and a nice bite in spite of its reduced alcohol of 42.3%. The writers also got a preview of the next Winchester Collection release, a much darker whisky in colour and flavour from a Vintage 1966 sherry cask that will be released in two years. Vintage 1964 was bottled on June 17 in decanters designed by Scottish glass artists Nichola Burns and Brodie Nairn with a jewel-like stopper of whisky-coloured Cairngorm stone fashioned by silversmith Richard Fox. Completing the package is a presentation cabinet crafted by furniture maker John Galvin. The Glenlivet is the No. 2 single malt whisky in the world.